“The Book is always better,” says an ad in the program. It’s put there by the Mormon Church which, with its enormous wealth and power, could easily have worked hard to shut down the highly irreverent musical, “The Book of Mormon.” Instead, they embraced the show, and used it to try to attract new members (“You’ve seen the play… Now read The Book,” says another ad). The missionary work of the Church of Jesus Christ of Latter-Day Saints is what the show is all about. Well, superficially, anyway. Just as the story of Joseph Smith and the Golden Plates is said in the show to be a metaphor, so one might say, is the entire production. Despite all its zany, over-the-top humor and nonstop silliness, it’s really about friendship and loyalty, and what all religions are really about (despite their different, and sometimes odd, origin stories): being good to each other, keeping the faith and maintaining hope. No matter that the tubby loser of a main character, Arnold Cunningham, teaches the Ugandan village folk that Jesus came from a Death Star, or that Joseph Smith died of dysentery (a story told, in song, far more graphically than one might wish). The message of caring and hope, and belief in Paradise and salvation, comes through loud and clear – even to the deranged warlord who shoots people in the face. When you’re dealing with the work of Trey Parker and Matt Stone, creators of “South Park” (who collaborated with Robert Lopez, of “Avenue Q” fame, on the book, music and lyrics), you have to expect that anything can happen and things are bound to spiral crazily out of control at one point or another, far exceeding the limits of good taste. Did someone say ‘good taste’ and “South Park” in the same breath?? 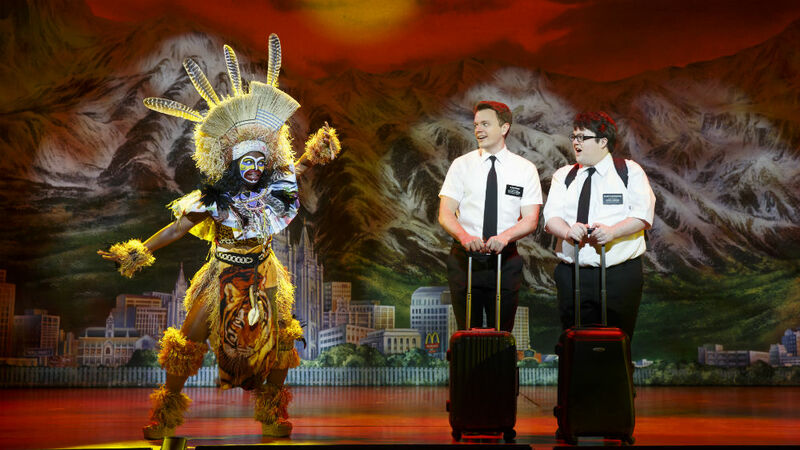 It’s well known that Parker and Stone have no sacred cows, so some of the tenets of the actual Book of Mormon get some serious drubbing (the show’s knockout number, “I Believe,” is the most amusing case). But of course, it’s all in fun, and if you can’t laugh at yourself…. All that fresh-faced doorbell-ringing in starched white shirts and skinny black ties is ripe for parody – and the writers literally stop at nothing, touching on repressed homosexuality (the hilarious “Turn it Off”), and bizarre ways to combat AIDS (Elder Cunningham has a little trouble with the truth). Not everything is funny, but there are certainly laughs aplenty for everyone. And there are even a few poignant moments. After nearly seven years of development, the show opened on Broadway in 2011 and garnered nine Tony Awards, including Best Musical. This second National Touring Company is excellent overall, with its wonderfully wacky set and costumes, bouncy orchestra (six touring, five local), strong voices and spectacular precision dancing (choreography by native San Diegan Casey Nicholaw, who creatively co-directed with Trey Parker). David Larsen (who appeared in “Hands on a Hardbody” in La Jolla and on Broadway) is a marvel as Elder Price, the egoistic, self-serving missionary whose idea of Heaven is “Orlando” and who thinks he’s the wunderkind who is personally is going to change the world. With his zillion-dollar smile, killer vocal chops and sharp dance moves, Larsen is every bit as good as the Broadway and L.A. performers. As his mis-matched partner, the ever-rejected, eternally whiny and insecure Elder Cunningham, Cody Jamison Strand is comical, though his voice can be shrill and he’s not as light on his feet as others in the role. The most attractive and willing young African, the first to be baptized, is Nabulungi (a running joke is Cunningham’s mangling of her name, everything from “Nutrogena” to “Babushka” to “Nicki Minaj”). At the performance I attended, there was an understudy, Tallia Brinson, whose voice was powerful, but her presence, somewhat less so. She was also the only African villager who spoke English without an accent, though her songs were sung with a pronounced dialect (her big number is all about her version of Paradise on earth, Salt Lake City, which in her version, comes out “Sal Tlay Ka Siti”). Pierce Cassedy is a standout as the closeted Elder McKinley, who tries to hide his true identity, though it keeps resurfacing (entertainingly) in spangled vests, boas, a pink suitcase and errant swishiness. The silly factor ramps up in the second act, but the ebullience is contagious, and it’s hard not to fall for the show and its nutty representation of “the fastest-growing religion in the USA.” You may not be converted to Mormonism, but you’re likely to become a “Book of Mormon” devotee. “The Book of Mormon” runs through June 8 at the San Diego Civic Theatre, 3rd and B Street, downtown. Performances are Tuesday at 6:30 p.m., Wednesday at 7 p.m., Thursday at 7:30 p.m., Friday and Saturday at 8 p.m., Saturday at 2 p.m., Sunday at 1 p.m. and 6:30 p.m. The entire two-week run is sold out, but there are low-priced Lottery tickets available. Entries are accepted at the box office starting 2½ hours before each performance (one or two tickets per person; only one entry/request per person). Two hours before curtain, names will be drawn for a limited number of $25 tickets.